Flower Myth celebrates it’s first year with a very special program, highlighting live performance with an ear towards the experimental dance floor. Beatrice Dillon takes stage at 23:00 for a rare Berlin concert. Stepping up up live and direct, her impossible future compositions render clear the dub binds and syncopations that connect rolling African drum traditions with UK roots steppers, house and jungle. Fresh off the release of his first solo full-length record on Apollo Records, Berlin’s prominent Paul Frick twists the organic into the unreal with his signature inverted keyboard mayhem. Flower Myth’s Eric Maltz lays down bass heavy hypnosis, while his melodies pierce the inner eye, featuring guest vocals from Mambo Punk. 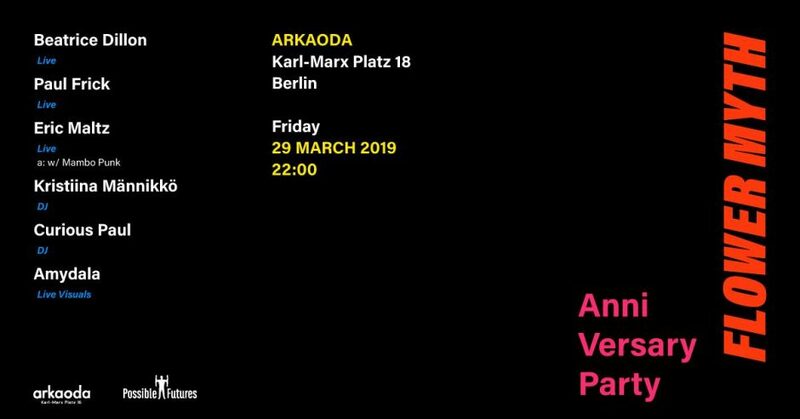 Helsinki and Kaiku resident Kristiina Männikkö and Curious Paul of Possible Futures bookend these three live performances with some ever surprising selections, while Visual Artist Amydala mines the sub conscious, lacing the walls with visual subliminal glitter.